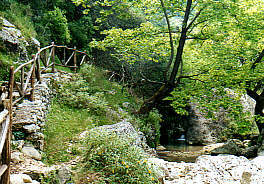 One of the favorite trips around Nidri on Lefkas, is a walk to the Vafkeri waterfall. 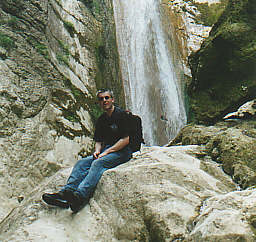 According to our guidebook, Greek people are fond of waterfalls. Anyplace where the stream drops over 1 meter is called a waterfall, even when there is only a tiny stream. So, we didn't expect to much when we went to Vafkeri. This was the first part of the waterfall we saw (downstream), and we said to ourselves: Well, that's nice. Of course, we didn't know there was more to come. 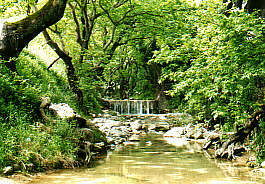 The Vafkeri waterfall actually consists of several waterfalls. You have to find your way along the water and every time you discover there is another waterfall to see. In several parts the stream drops a couple of meters. The further you get up, the better it gets. This horsetail is the highest part of the waterfall, and the best. 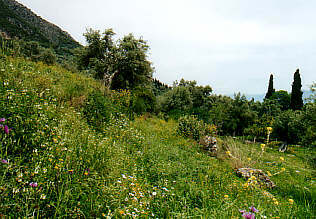 It is about 10 meters high, and on three sides there is rock around. The water is a bit cold, but certainly deep enough to take a swim. 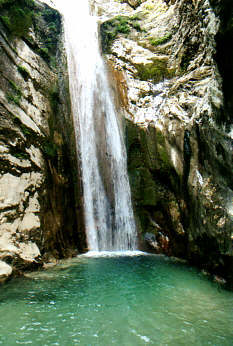 We thought it is a beautiful waterfall, not only according to Greek standards. 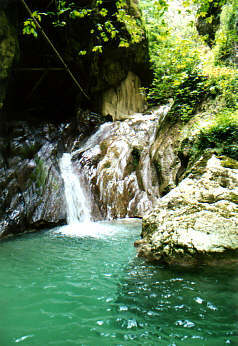 Unfortunately, most of the tourists will not find this great waterfall, because in summer there is hardly any water. We saw a postcard, where the stream was not more than a quarter of this amount. So when you want to see the Vafkeri waterfall: travel in April/May.